While traversing Lancaster Pike in Hockessin, I passed a friendly looking barn-like building, complete with green roof and faux silo. Intrigued, I made a very illegal u-turn. What I found was The Well Marketplace. 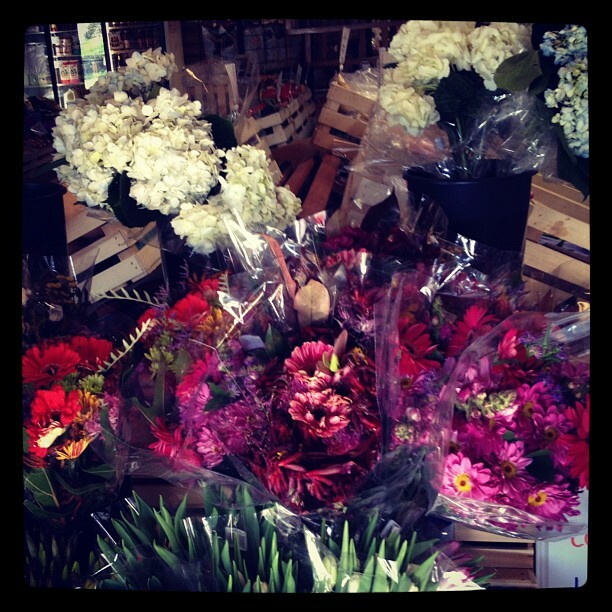 When I entered the store I was greeted by a happy sight–an array of flower bouquets. A nice welcome. The store is not large. In fact, I would say it’s more of an upscale convenience store than a full-fledged market. 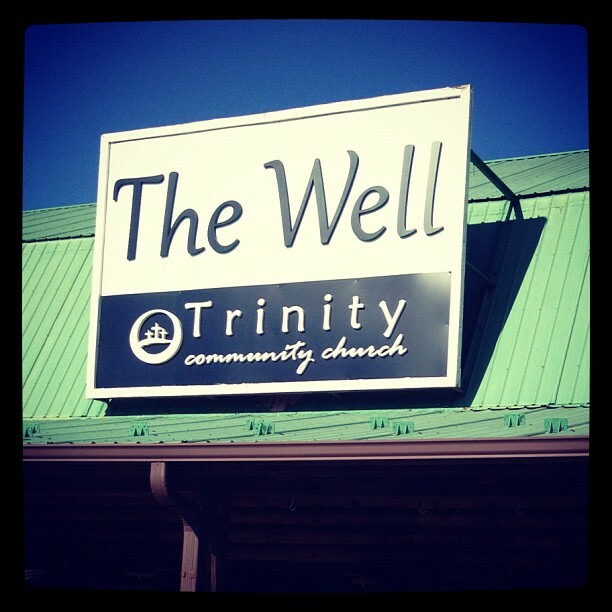 In fact, The Well is so convenient it offers grab and go prepared dinners, catering, Bishop’s Coffee Company, and a deli counter. I made a beeline for the back of the store where they sell flavored oils and have a few freezers. It was there I found my first local product. 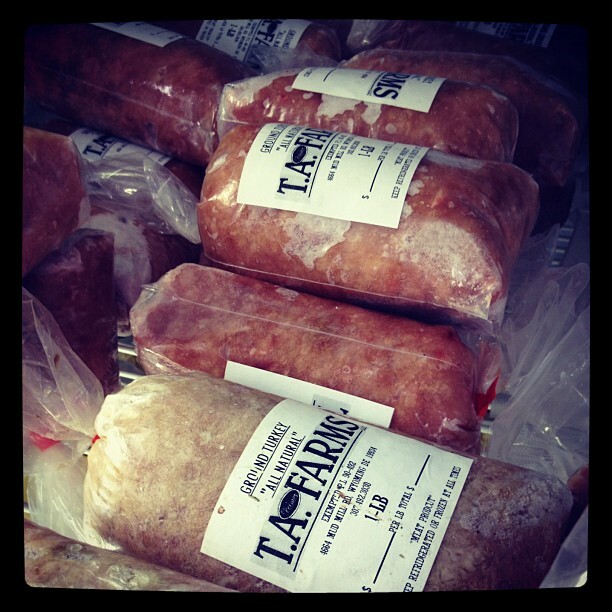 Frozen ground turkey from T.A. Farms in Wyoming, Delaware. I snagged a pound for some chili I’ve been wanting to make. 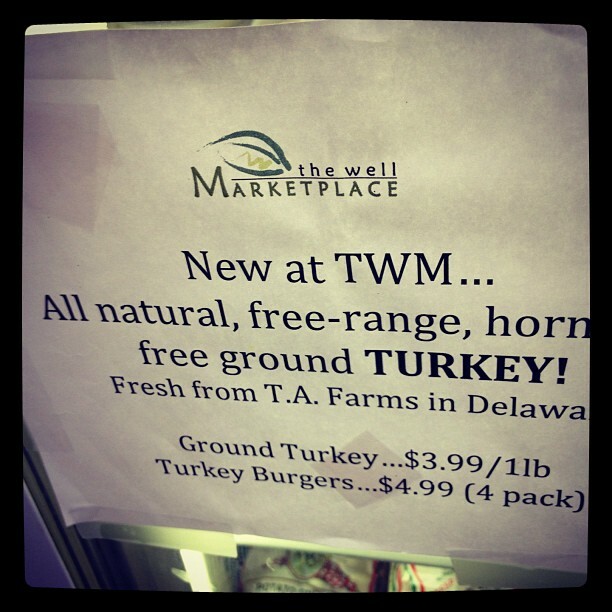 Free-range, hormone-free ground turkey from a Delaware farm! In the corner of my eye, I saw a bright and glorious light pulsing from the neighboring freezer. Tentatively I opened the freezer door and saw. . .ice cream. Lots of ice cream. 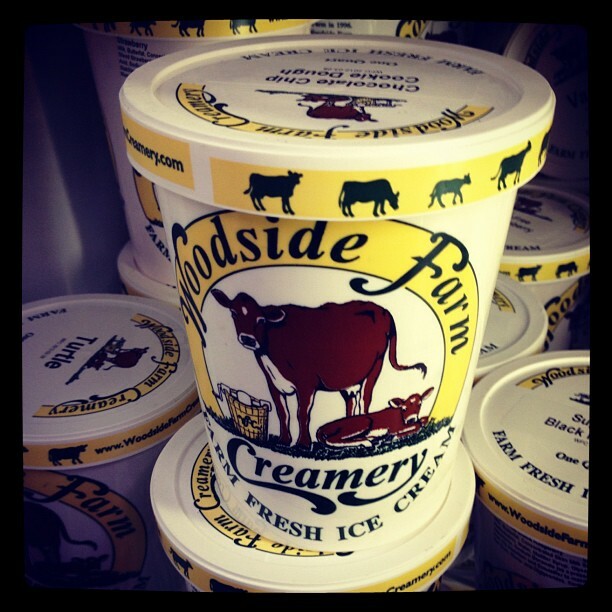 But not just any ice cream, Woodside Farm Creamery ice cream, sold by the quart and pint. No need to feel trapped by the limits of a cone anymore! After the happy music in my head subsided, I turned to the right and saw something equally as delicious. Vegetables! 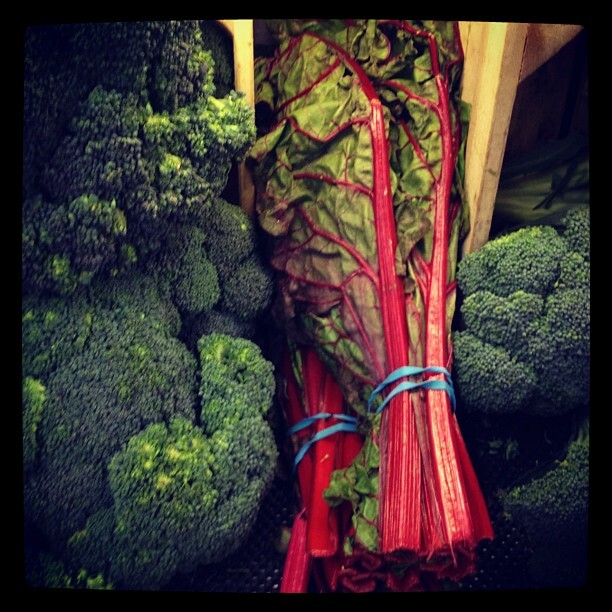 Swiss chard, radishes, lettuces. All looking divine in their refrigerated home. The Well takes their 26-foot truck to Philadelphia twice a week to stock up on fresh produce, but from March to November they head to the Amish Produce Auction for local produce (you know I love me some Amish!). If you’re in the Hockessin area and need a quick bite, some flowers for the dinner table, or local ice cream for dessert, The Well Marketplace is the convenient and local place to go. Season the turkey liberally with salt and pepper. In a large soup pot, brown the turkey. Add the onion and garlic. Saute for a few minutes. Add all of the spices except the bay leaves and cinnamon stick and saute for one minute, making sure to stir to get the spices all toasty. Add all three of the peppers and some more salt and pepper. Add the tomatoes and the beer. Give it a good stir. Now add the drained and rinsed beans, along with the bay leaves and cinnamon stick. Give it another stir. Now let it simmer, uncovered, for at least a half an hour. I let it simmer for more than an hour. Remove the cinnamon stick and bay leaves. Serve with spring onions or like I did with a dollop of plain yogurt (I ran out of sour cream) and some diced red onions. I can’t wait to add some fresh, local corn to this recipe! I really like cinnamon in my chili also. Great flavors and great find. 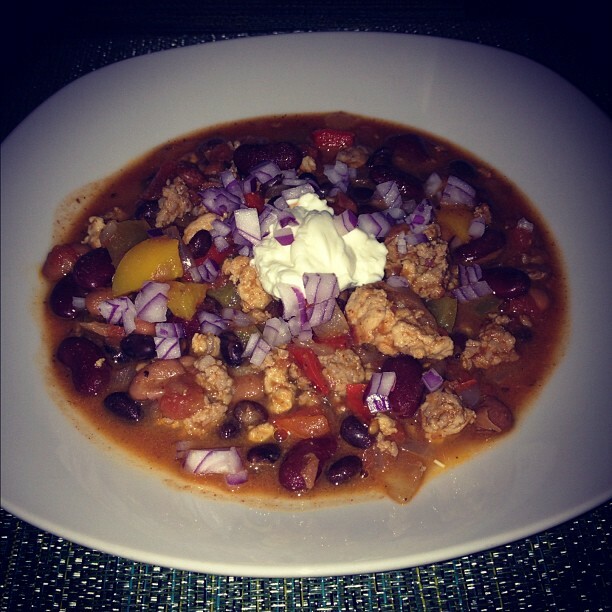 I added a cinnamon stick one day because the chili needed some warmth, not heat, just warmth. It’s a great addition. so jealous of that market!! 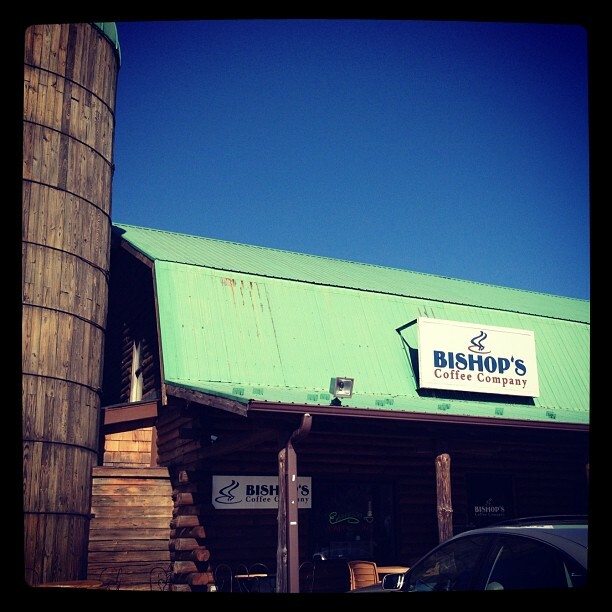 It’s such a cute place! Thanks for checking it out. Time for me to get in the car and check it out! Hi, Geri! You must. Buy me a pint of ice cream while you’re there. 🙂 Thanks for stopping by.